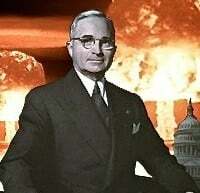 Some time ago, I wrote a blog post about a hypothesis I had regarding President Truman and the decision to use the atomic bomb. My basic thesis then (and continues to be) is that there is good reason to think that Truman did not understand that Hiroshima was a city with a military base in it, and not merely some kind of military installation. Truman’s confusion on this issue, I argue, came out of his discussions with Secretary of War Henry Stimson about the relative merits of Kyoto versus Hiroshima as a target: Stimson emphasized the civilian nature of Kyoto and paired it against the military-status of Hiroshima, and Truman read more into the contrast than was actually true. It is a general point that sometimes comes up when talking about the work of history: a lot of people think new work is driven exclusively or even primarily by access to new sources. New sources can play a role but usually it is new questions that drive historical innovation. The new questions can provoke re-reading of old sources, and can point towards overlooked sources as well. The hardest thing in any field of knowledge is coming up with a new, interesting question to ask — answers are much easier to find and deal with than new questions. Harry S. Truman, “Radio Report to the American People on the Potsdam Conference” (9 August 1945), Harry S. Truman Library, Independence, MO. Barton Bernstein, “Reconsidering the ‘Atomic General’: Leslie R. Groves,” Journal of Military History 67, no. 3 (July 2003), 889-920, esp. 904-905. Longhand note of Harry S. Truman (9/10 August 1945), transcript and copy available in Harry Truman Library. “Draft of a Speech by President Truman on Berlin Conference,” (n.d., first draft), Papers of Samuel I. Rosenman, Harry Truman Library, “Report to the Nation (Potsdam),” pages 2 and 6. “Draft of a Speech by President Truman on Berlin Conference,” (n.d., second draft), Papers of Samuel I. Rosenman, Harry Truman Library, “Report to the Nation (Potsdam),”, page 5. Harry Truman, Potsdam Journal entry for 25 July 1945, Harry Truman Library. Harry S. Truman, “Draft of the Gridiron Dinner Speech,” (15 December 1945), Harry Truman Library. Diary entry of 21 July 1948, in David E. Lilienthal, Journals of David E. Lilienthal, Volume II: The atomic energy years, 1945-1950 (New York: Harper & Row, 1964), 390-391. See Barton J. Bernstein, “Truman at Potsdam: His Secret Diary,” Foreign Service Journal (July/August 1980), 29-34. “I showed the President the teletype report from Guam showing the extent of the damage; also, the Wire Service bulletin showing the damage as reported by Tokyo at nine A.M. August 8th. I showed him the photograph showing the total destruction and also the radius of damage which Dr. Lovett had brought me from the Air Corps just before I went. He mentioned the terrible responsibility that such destruction placed upon us here and himself.” “Memorandum of Conference with the President” (8 August 1945), attached to Henry L. Stimson diary entry of 8 August 1945, in The Henry Lewis Stimson Diaries, microfilm edition retrieved from the Center for Research Libraries, original from Manuscripts and Archives, Yale University Library, New Haven, Connecticut. See the “Gridiron Dinner” speech, previously cited. Henry A. Wallace diary entry of 10 August 1945, in Henry A. Wallace, The diary of Henry Agard Wallace, January 18, 1935-September 19, 1946 (Glen Rock, N.J.: Microfilming Corp. of America, 1977).